I'm sure you know the old saying " if it ain't broke, don't fix it ! (or in my case don't update it)" and it happened again this week - I broke vlc - it used to work just fine until this last update (picture above). Since Debian use the same soname packages name than my packages, official packages (vlc, totem, etc...) linked against libavc* doesn't work with my libavc* packages. 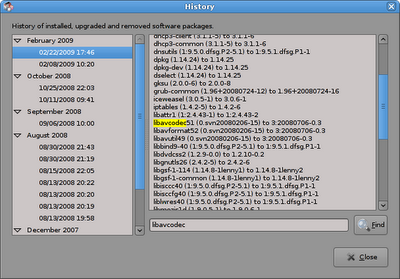 If you want to use vlc and friends you need to downgrade libavc* packages to the official packages. 0.svn20080206-8 is the unstable version and 0.cvs20070307-6 for testing (check with apt-cache for the current version). Mmmh, it has been broken since June 2008 ?! in synaptic > set prefer version from "oldstable"
Mmmh - should work ? !